The Driftless area is a region encompassing parts of southwestern Wisconsin, southeastern Minnesota, northeastern Iowa and northwestern Illinois. The area got its name due to the lack of glacial deposits, “drifts”. What this translates to is a region of deep carved river valleys with some of the best trout fishing in the midwest. We first heard about this area from Jen Ripple, editor/founder of Dun Magazine when she spoke at the 2017 GRTU TroutFest. Ever since, we’d been excited about fishing this region. Our first stop in the region took us to Viroqua (WI) to fish the West Fork of the Kickapoo, our “Driftless Kick!” start. We next went to an area near Rochester and Lanesboro (MN) to fish the Whitewater and Trout Run streams, two more fisheries that are a part of the TU Greatest 100 Trout Streams. To be honest, the area around our campground reminded us a lot of where we grew up in the country outside Kansas City. 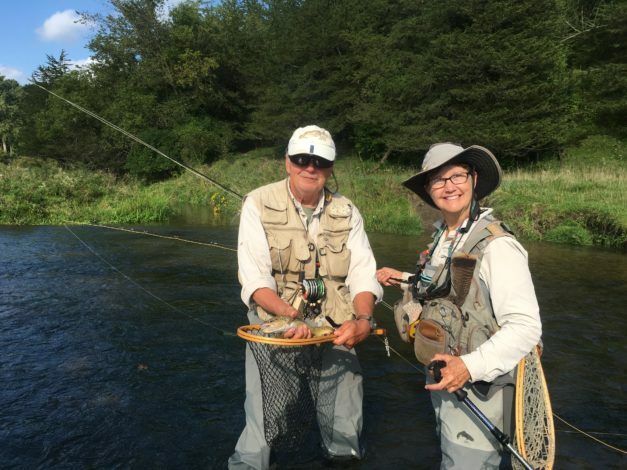 However, when we drove to meet our guide, Mike Lewellen, of Troutlaws Fly Fishing Guide Service and followed him to the Whitewater River, the “Driftless” landscape emerged before us. Our day on the Whitewater was filled with beautiful brown trout at most every bend of the river. As we finished our day on the Whitewater, we talked with Mike about our guide trip on Trout Run in a couple of days, and asked him where else we might fish. 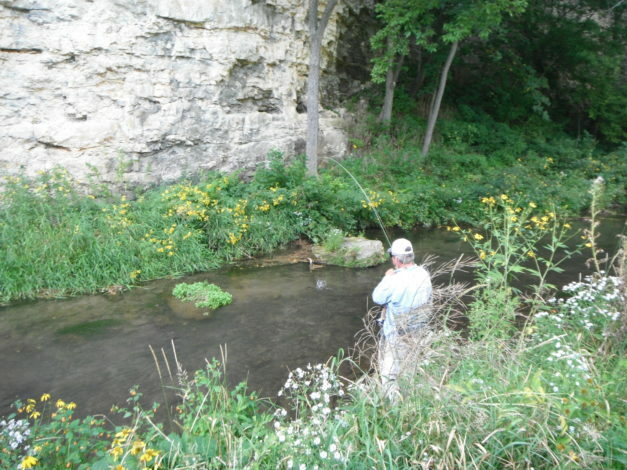 He recommended Ducshee Creek near Lanesboro (MN). 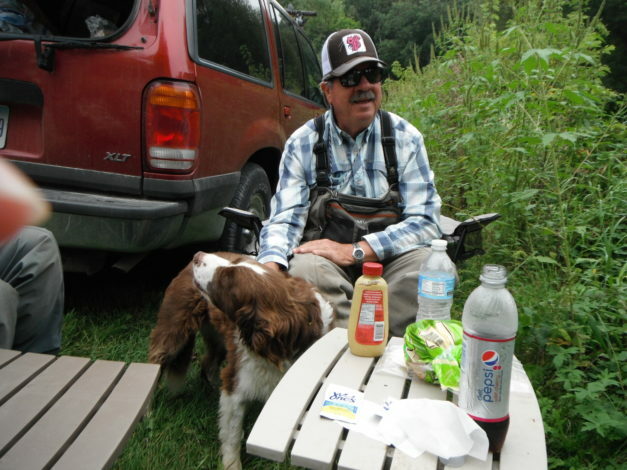 Later that day, back in the campground at Chester Woods, Mike dropped by the SaraLinda and as we talked more about fishing Duschee Creek, Mike indicated he’d like to show it to us…. what a treat! The deal was struck, we’d meet Mike in Lanesboro, buy lunch and he’d show us Duschee Creek. We met at the Root River Rod Company in downtown Lanesboro, a really cool little town and a VERY nice fly shop. After spending some time in the shop and lunching on bison hotdogs, we headed out to fish Duschee Creek. The creek was absolutely beautiful and it was a great pleasure fishing with Mike. We all hooked into some gorgeous brown trout throughout the afternoon and came upon a unique flower bed as well. The next day we headed to Trout Run. I mean…. any stream named “Trout Run” has to be good…. right? When we got to a small bridge near a couple of small farms, we saw three other cars parked alongside the road, obviously other fishermen. Getting out of the car, Mike told us not to worry, there were miles of stream, in both directions from the bridge, full of trout. We decided to head upstream a ways to begin our day. After a morning of catching a few trout here and there, we headed back to the car and were met by the local dog who entertained us during lunch…. entertained meaning he really was hoping we’d share some lunch with him. After lunch, we headed back up stream further to a hole Mike really wanted us to fish. 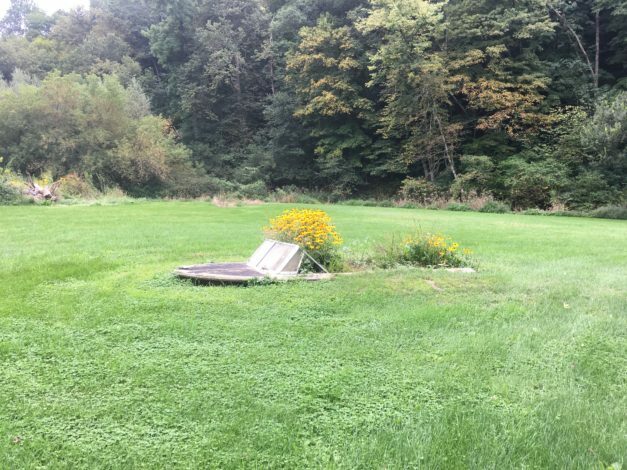 I have to tell you, the folks in the “Driftless” area, fishermen, landowners and the state, have struck a great deal in providing access to streams. While landowners have their properties fenced, primarily for cattle, there are ladder crossings near all the streams so anglers can easily cross fences to continue moving up/down stream. We were both so impressed with this cooperation on the part of everyone. That afternoon on Trout Run, Barb schooled me but good! She hooked into some big, gorgeous “Driftless” browns at several different runs along the stream. At one point, I was stalking a far bank run for a few trout that kept rising, teasing me but not taking my dry fly when I heard both Barb and Mike yelling at me to come up and fish with them. Little did I know that while I was stalking with little success, they were in a hole with some great fish. I’ll move faster next time! We had the distinct pleasure of fishing with Mike for three days in southeastern Minnesota on three different streams. I’m sure a lot of fly fishermen take the drive along I-90 from Chicago and points further east and head west to fish in Wyoming and Montana. 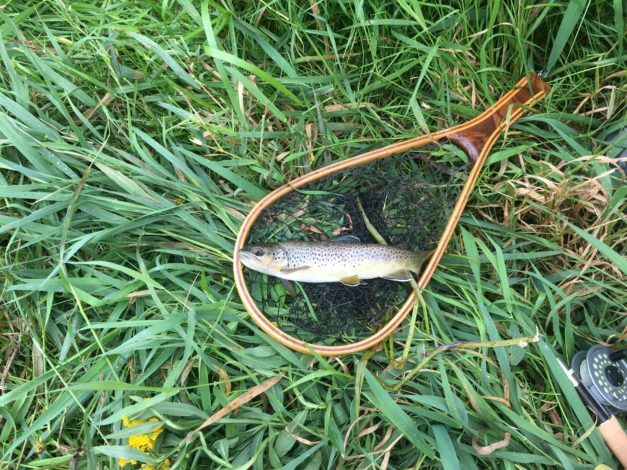 I would highly encourage them, and all our midwestern friends, to make sure to stop in southwestern Wisconsin and southeastern Minnesota and fish the Driftless area streams. We barely touched all the fishing opportunities available here. Make sure if you do, you call Mike at Troutlaws and book at least three days to fish this amazing area. We’ll for sure be coming back again! PS Yes, that’s a Pink Squirrel on my hat! It’s a famous fly pattern in the “Driftless” area as it turns out. I couldn’t resist buying and wearing it while we fished the area.